Home	/ Edwire	/ Student Anxiety – What Can Teachers Do? Universal supports involve all students and teachers and have an impact on the whole-school environment. Educators are well positioned to provide these as part of the classroom experience. When teachers build relationships, they are a soothing and supportive presence and they take the time to develop rapport and trust with all students, but those with anxiety in particular do much better. When educators maintain a calm, patient tone of voice when talking with students who are feeling anxious and model healthy behaviour, students feel safe and supported. In addition, when educators provide a safe environment with predictable routines and structures, advance warning of any changes in routine and when they acknowledge and reward progress toward their goals, students are able to develop confidence in their ability to cope. When students feel anxious, practicing relaxation exercises help them calm down their physical responses to anxiety. All students can benefit from relaxation strategies but for some, it is essential. Teaching strategies such as awareness of thoughts and feelings helps students to better recognize their anxious thoughts and feelings and to develop strategies to cope with them. Educators can help students do this through modeling and coaching. When teachers build relationships, they are a soothing and supportive presence and they take the time to develop rapport and trust with all students, but those with anxiety in particular do much better. Positively reinforcing efforts by students who seek help – usually those students who are afraid to ask for help (perhaps for fear of being criticized or looking stupid) – by creating a learning environment in which students feel welcome to speak up and socialize helps them to feel reassured. One way to support this is by pairing students who are anxious with students who are open and welcoming. Students who are anxious may have difficulty interacting with others and knowing how to effectively solve problems. Explicitly teaching problem solving skills as part of what happens regularly in the classroom will help to normalize this instruction for all students but particularly for those students who need it. For some students, writing tests and exams can be overwhelming and incapacitating. They need someone who understands and provides them with the necessary accommodations such as additional time if needed, opportunity to write in a quiet place, and encouragement to gradually face the feared situation. Universal strategies support students with anxiety by reducing their symptoms of anxiety, but for some students, more targeted strategies may be necessary. The same is true for a few students who have more complex needs and may require more intensive support. 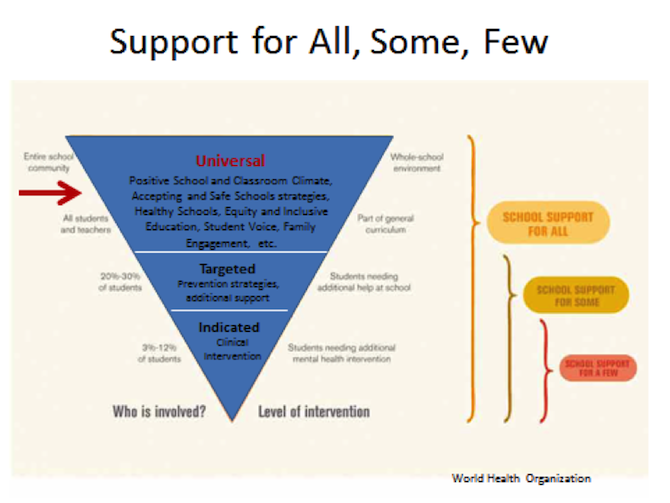 For students who require targeted or more intensive support, it is critical that a school board or community mental health professional be consulted.